When I made pumpkin pie last year, I used a Cinnamon Hazelnut Crust, but if you prefer a more traditional type pie crust, you simply use all almond flour and make a Cinnamon Almond Crust instead. 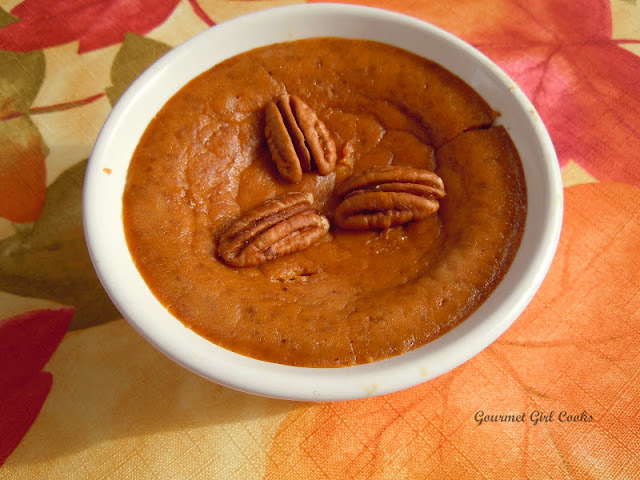 For the pie filling, I use the recipe on the can of Libby's pure pumpkin puree as my general guide and then make a few simple modifications. One of them is substituting 3/4 cup of Swerve (instead of 3/4 cup of sugar in the original recipe). I also reduce the amount of milk/liquid to 8 ounces (instead of the 12 ounces evaporated milk in the original recipe). You can use 8 ounces of whatever type milk product you prefer (cream, half-and-half, canned coconut milk or almond milk) or a combination like I did last year. By reducing the volume of milk, it helps keep the pie thick and rich and not too liquidy and also reduces the carbs a bit. When using nut flour based crusts (either hazelnut or almond flour), it is best to keep the temperature a bit lower since pies take a bit longer to bake than many other baked products. Nut flours are more susceptible to burning, which you want to avoid. A hazelnut crust will produce a darker and stronger tasting crust; an almond flour crust will produce a more traditional flour-type crust that most people are use to. If you prefer, you can also omit the crust altogether and make individual crustless pumpkin pies and just mix and bake according to the instructions. I have made them both with and without crust. I actually prefer pumpkin pie without crust, especially after a big holiday meal...but it's delicious either way. The crustless version is also nice and quick to put together. Below are a couple of pictures of my pumpkin pies from last year (one with a cinnamon hazelnut crust and a crustless version). I've made a few minor updates to the recipe posted below and am reducing the baking temperature a bit to better ensure the pies won't burn. Enjoy! Preheat oven to 325 degrees F. Place all crust ingredients in a medium bowl. Cut butter and egg into flour, cinnamon and sweetener with a pastry/dough cutter until mixture resembles small pebbles and the flour is thoroughly moistened. Press crust mixture into a 9 or 10" pie dish or 2 smaller 6" pie dishes or tart pans. Bake for approximately 8 to 10 minutes; remove from oven and set aside. Increase oven temperature to 375 degrees F. In a medium bowl, mix all filling ingredients well until smooth and well blended. Pour filling into pie dish or pan. Bake at 375 degrees for 15 minutes; reduce heat to 350 degrees and bake an additional 15 minutes; reduce heat one more time to 325 degrees and bake an additional 20 to 30 minutes, or until knife inserted near center comes out clean. Cool approximately 2 hours; serve at room temperature after 2 hours or refrigerate. Serve topped with whipped cream or vanilla ice cream, if desired. ***Note: To make individual crustless pumpkin pies, pour filling into small greased custard cups or ramekins and follow the baking instructions above. mmmmmmmmmmmmmmmm I can taste it from here!!! Great idea and recipe. Thanks! My crustless pie is in the oven now. Can't wait to try it. I used fresh pumpkin that I cooked recently so I'm anxious to see how it turns out. If I were to use a no-bake filling for your crust. How long would I cook it and at what temperature? Thank you and I hope you have a wonderful Thanksgiving. I made a 9" pumpkin with your recipe using Truvia baking blend (I can't get Swerve where I live) and coconut milk. I'e made it for Thanksgiving and Christmas and both times it got rave reviews. Thanks so much for this recipe. It's a keeper. Hello, I would like to make this pie, just wondering if the cream that is listed is the same as whipping cream? Hi! I was just reviewing your recipe again and saw that I never responded to your question from 2 years ago. Sorry! I have made your crustless pie several times with my fresh pumpkin and it is delicious. 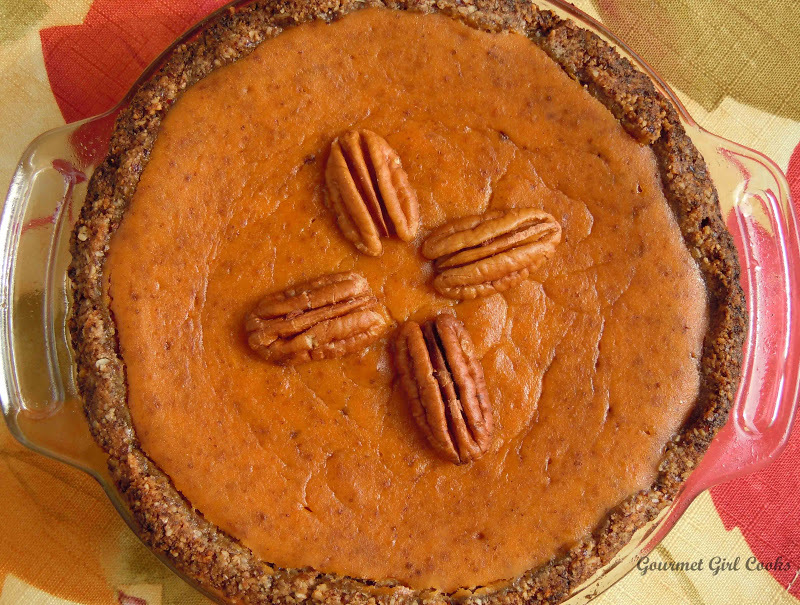 Using the fresh pumpkin gives the pie a little lighter texture than when using canned. I like both but fresh is my favorite. Cooking the little sugar pumpkins is so easy and it is so delicious. Try it! Can you make a 9" without crust? Or just individuals with those baking methods? Yes you can make a crustless 9-inch. You will simply need to adjust the baking time. Darn! Mine is burnt pretty badly! I'm sure the filling will be delicious, though. :) I followed the directions with temps and time. Maybe I need an oven thermometer to make sure it's not off. Sorry about that Cari. Nut flours definitely burn more easily so you might want to double check to be sure. This year I made them crustless. Oh, no sorry necessary. I expected it might burn. HOWEVER, it ended up only being the top edge that burned. The rest was perfect, and it was delicious! Thank you!